Image: Tiger swallowtail butterfly on wild lupin. Image uploaded to wiki media by Dr Gordon E. Robertson. Click here to get the pdf of all the Science Writing Prize 2014 shortlisted and winning articles. Last summer I entered into the Wellcome Trust Science Writing Prize (#SWP2014) and was lucky enough to be shortlisted. Previously I posted my entry here on my blog and you can still find a copy of the draft I submitted below. However, as part of being on the shortlist I had the opportunity to work with Micheal Regnier an writer/editor from the Wellcome Trust Mosaic blog. With his help my piece was much improved and published online here (or click on the image to the left). I thought people might be interested in seeing both the submission (below) and the final edited version. Please check them out. With its tall spike covered in brightly coloured flowers, the garden lupin (Lupinus polyphyllus) is a perennial favourite in English gardens. However, although this plant is magnificent to look at, ingestion of even a small amount can be dangerous and it is potentially deadly if large amounts are consumed. Like many plant species, lupins produce toxins in order to protect themselves against herbivores. One such class of toxin is the cyanogenic glucosides, molecules that break down to generate hydrogen cyanide—the same deadly compound released by the suicide pills of early 20th century secret agents. Hydrogen cyanide is deadly due to its potent inhibition of the mitochondrial respiratory chain, cellular machinery central to the metabolism of most life forms. Therefore, by producing cyanogenic glucosides lupins defend themselves against a broad range of herbivores that would otherwise feast on their leaves with impunity. In spite of this general toxicity, lupins are important food sources for the larva of many species of butterflies. Notably, the caterpillars of some species consume so much toxic plant tissue that, after metamorphosis, the butterflies themselves are poisonous. This resistance to cyanogenic glucosides is not unique to butterflies, but is also seen in other herbivorous arthropods such as the common two-spotted spider mite. The mechanism responsible for the butterflies’ and mites’ resistance to cyanide poisoning had eluded entomologist until recently. In a paper published in April in the scientific journal eLife, an international team of scientists led by Thomas Van Leeuwen at Ghent University identified the enzyme responsible. In order to learn the identity of the detoxifying enzyme, Van Leeuwen’s team went after the gene in the mite’s genome that codes for it. They reasoned that a mite fed on a toxic-plant diet would need to produce more of the detoxifying enzyme than a mite fed on a non-toxic diet. The cells of the mite fed on the toxic plant would need to increase its production of the cellular messages (messenger-RNAs) “transcribed” from the gene encoding the detoxifying enzyme. By comparing the levels of the messenger-RNAs produced by the different populations of mites, they would be able to identify the up-regulated transcripts and, by extension, the gene and enzyme responsible for the cyanide resistance. “To our surprise, only a limited number of genes changed expression after long term evolution on a cyanogenic host,” says Van Leeuwen. Even more surprisingly, although all the genes identified reside in the mite’s genome, one of them was not of arthropod origin, but instead looked like a gene commonly found in bacteria. “We did not anticipate finding this,” says Van Leeuwen, “and decided to study it in more detail.” The researchers then demonstrated that this ‘bacterial’ gene coded for an enzyme that converts the deadly hydrogen cyanide into a harmless intermediate of amino acid synthesis. 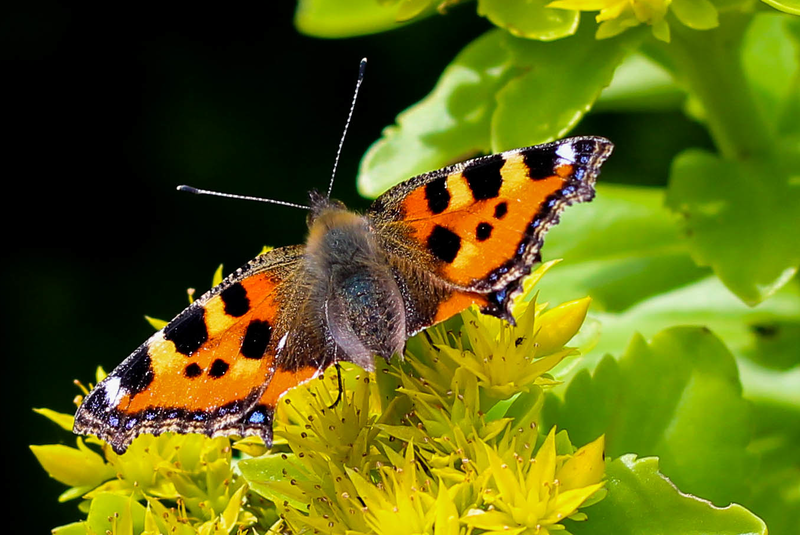 Similar ‘bacterial’ genes were then identified in the genomes of butterfly species. Small tortoiseshell butterfly resting in the evening. Photo by Gurdeep Minhas. So, how did a bacterial gene wind up in the mite’s and butterfly’s genomes? What Van Leeuwen and his team discovered is an example of ‘horizontal’ gene transfer. Generally, genes are transmitted ‘vertically’ down the generations from parents to their offspring, each generation getting a near exact copy of its parents’ genome. Small differences introduced into the genome by random DNA-copying errors may result in increased fitness for the progeny, giving certain individuals a competitive advantage. In this way, organisms slowly evolve by natural selection over millions of years. However, heredity is not always so straightforward. In addition to being copied, segments of DNA can also be cut and pasted from one position in the genome to another, in a process known as transposition. In rare cases, a segment of DNA can be cut from the genome of one organism and pasted into the genome of another, so called ‘horizontal’ gene transfer across species, such as that discovered by Van Leeuwen’s team in the mites and butterflies. “This is probably an ancient transfer that occurred independently to both mites and butterflies,” says Van Leeuwen, “which illustrates the importance of the enzyme.” Incorporation of this bacterial gene provided resistance to cyanide poisoning, opening up entirely new food sources for the herbivorous arthropods and allowing the butterflies to evolve new defence strategies by sequestering the plants’ poisons.